How do I use the Music Player on my Samsung Galaxy S5? 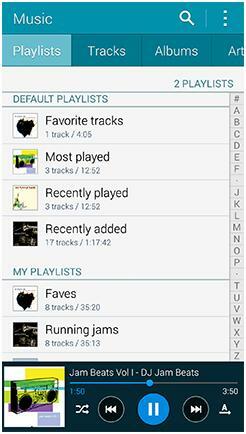 The Music application lets you play music files stored on your device or microSD card. The Music application supports the follow music files: 3GA, AAC, AMR, AWB, FLAC, IMY, M4A, MID, MIDI, MP3, MXMF, OGA, OGG, OTA, RTTTL, RTX, WAV, WMA and XMF. 1. Touch Apps > Music . Your mobile device will scan for music on the device and microSD card. 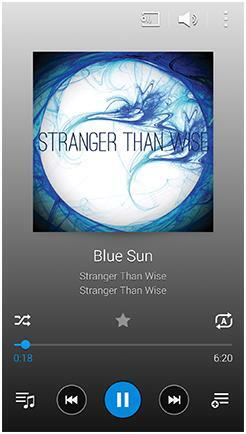 The Music application has two primary views: Library view and the Now playing view. From within the Library view you can navigate using the tabs at the top of the screen. Customise which tabs display by touching More options > Settings > Tabs. Playlists: shows your created and default playlists such as Favourite tracks, Most played, Recently played, and Recently added. Tracks: lists all tracks in alphabetical order. Albums: groups all songs and albums under their contributing artists. Genres: groups songs by type of music. Music square: lets you build a playlist based on your mood. 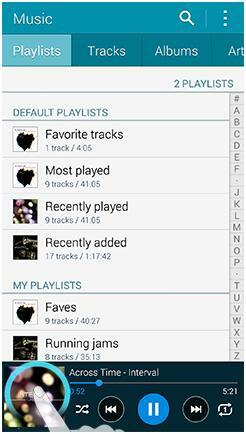 Folders: shows the folders containing music on your device and memory card. Devices: shows the music files on nearby devices. Note: the Devices tab will only be displayed when devices are detected on the same Wi-Fi network as your device. Touch More options > Grid view to switch to a thumbnail view. Touch More options > List view to switch to the list view. This option is not available in all tabs. Touch a song in your library to listen to it. The song will begin playback in the Now Playing view. Touch Back to return to the Library view. You can continue to navigate the application and the basic song controls will remain at the bottom of the screen. Touch the album cover image to return to the Now Playing view. Set as: set the song as a Phone ringtone, Caller ringtone or Alarm tone. Choose whether to use the song from the beginning or use the auto recommendations to play a highlight from the song. Tabs: place check marks next to the tabs you want to see in your music library. Playlists: place check marks next to the preset playlists you want to see in your music library. Adapt Sound: when a compatible headset is connected you can turn on this effect to enhance the sound through the earpiece. Play speed: increase the playback speed to up to two times faster or slow it down by half the speed. Music auto off: set an auto-off timeout for playing music. When this feature is turned on the music player will turn off music playback after the selected timeout has been reached. Lyrics: select this option to equalise the volume level of each track automatically. Details: view the details of the current song. Touch Edit to manually input the song information. 1. From the library view touch the Playlists tab. 3. Enter a name for the playlist and then touch OK.
4. Touch Add tracks and then place a check mark next to the songs you would like to add. 5. Touch Done to save the playlist. 6. Touch Back to return to the Playlists tab. 2. Touch the playlist to edit. 3. Touch Add tracks and then place a check mark next to the songs you want to add or remove the check mark from the songs you wish to remove. Touch Done. 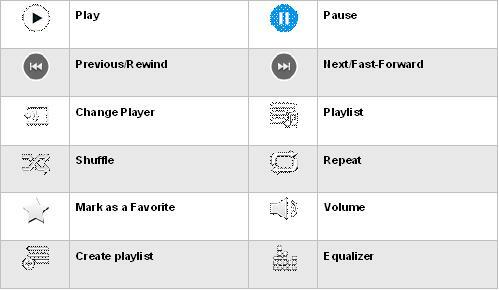 Select: remove songs from the playlist or create a new playlist based on the selected songs. Edit title: rename the playlist. Change order: select the order in which the songs are played. Remove: place a check mark next to the songs you want to remove from the playlist. Settings: access the Music settings. Music square creates a playlist depending on your mood. 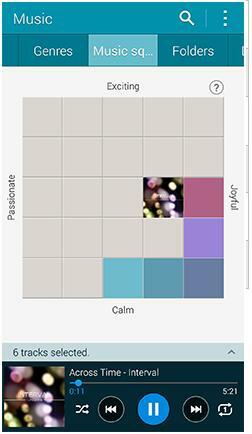 Simply touch a square on the grid and Music square will analyse the tempo of the songs in your library to match your mood. To play multiple songs touch and drag your finger across multiple squares. From the Library view touch the Music square tab. Four tempos or moods are available: Exciting, Joyful, Calm and Passionate. How to use Dolby Atmos (surround sound)?